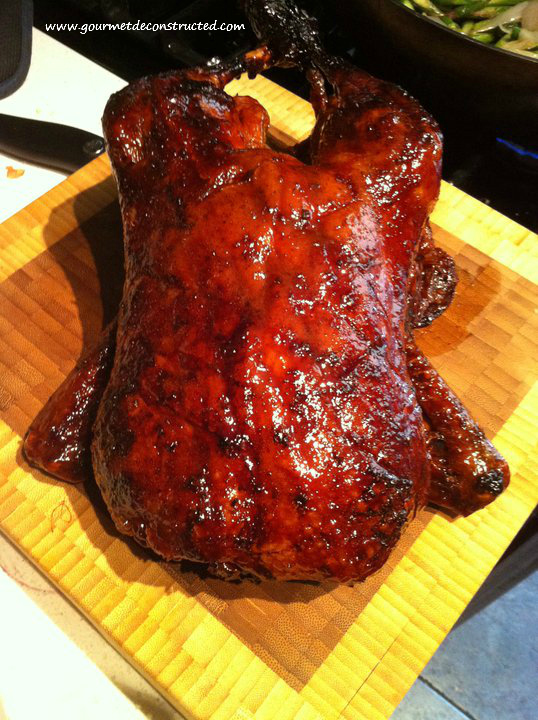 There is nothing like a delicious roasted duck with a crispy skin and a tasty glaze. This recipe is right on time for the holiday season, enjoy! I really love this roast duck recipe, it takes a bit of time to prepare, but if it’s done correctly you won’t regret trying it. Enjoy! Pre-heat your oven to 250F and get your water boiling. Remove all excess skin and fat from the duck, then rinse and pat dry with paper towels.. You can freeze and save the innards to make a tasty duck stock at a later date. Once the duck is dry, take a sharp knife and score the duck skin without cutting into the meat, you can also use the tip of the knife to poke holes in the skin. 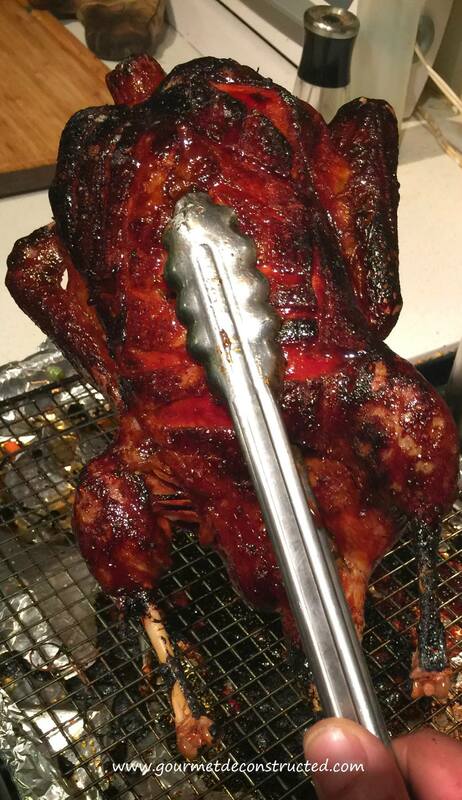 Fold neck skin under body, tie the legs together with twine, then put duck, breast side up, on a rack in a 13- by 9- by 3-inch roasting pan and pour boiling-hot water over duck (to tighten skin). Cool duck, then pat dry inside and out, reserving water in the pan, then rub duck inside and out with kosher salt and pepper. Add all glaze ingredients to a small saucepan and reduce it over medium heat, stirring occasionally, until it has thickened and becomes syrupy, cover & set aside. ( I like to make the glaze while the duck is in its 3rd hour of cooking). Put the duck in the oven, (breast side up) for 1 hour, then remove from oven. Turn duck over (breast side down), and roast 1 hour. Turn duck over again (breast side up), and roast 1 hour. Turn it over and roast (breast side down) for 1 more hour. Remove duck from the oven, turn the heat up to 425F, and coat the duck completely with the glaze using a silicon brush. Return the duck to the oven and cook under the higher heat for 10 minutes. Remove from the oven and allow the bird to rest for 10 minutes before carving. Bon Appetit! Posted on December 9, 2016, in Poultry, Wild Game and tagged duck, duck recipe, honey glaze, molasses, poultry recipe, roast duck, spicy, Sriracha, Sweet and spicy. Bookmark the permalink. Leave a comment.